�����The new Palladium coin hit the market last Thursday during the Long Beach Expo, and by Friday the premium had jumped to as much as $500 per coin. 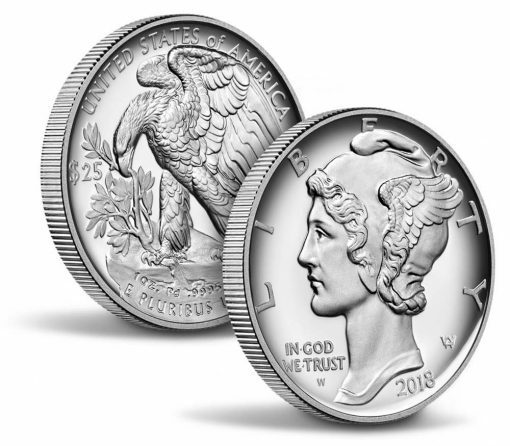 The U.S. Mint had just released their latest bullion coin, the $25 one ounce Proof Palladium coin, with a limited mintage of just 15,000. It sold out within minutes as sales were also limited to only one coin per household. The aftermarket quickly moved from $100 to $500 over cost, and currently there are buyers for this modern rarity at $2,500 for those coins that make the PR70 grade. The Mint was selling these coins for $1,387.50 so those buyers able to acquire the $25 Proof Palladium directly stand to make a nice profit. �����While Gold still remains under $1,200 an ounce, buyers were taking advantage of these low levels in Long Beach where a few dealers reported accumulative bullion sales approaching a million dollars. Gold is currently at $1,195 and Silver is at $14.15. Proof Gold Eagles in the original government package are trading at $1,225 and Proof Silver Eagles are at $35 each. 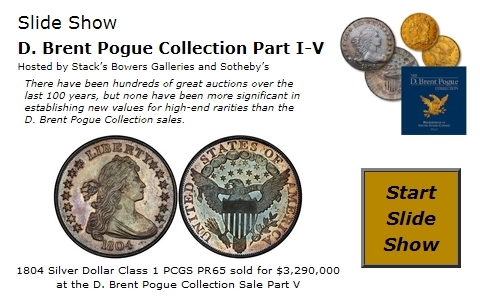 �����Heritage Auctions held the official sale for the Long Beach Expo with a pair of $50 Gold coins highlighted, both bringing prices just under the current NumisMedia Market values. The 1915 S $50 Gold Pan-Pac Octagonal in PCGS MS63 sold for $72,000, our current Market value is at $75,000. There are 277 coins certified in this grade by PCGS and NGC combined. The 1915 S $50 Gold Pan-Pac Octagonal in NGC MS64 sold for $90,000, the Market value for this grade is at $95,000. 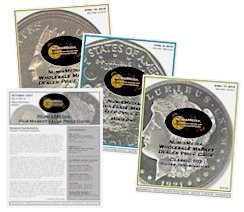 The population for this grade of MS64 is 293 coins total certified and there are an additional 89 grading higher with the highest being NGC MS67. Below are some of the other Heritage Sale highlights. �����The majority of adjustments in the HD Wholesale Market Dealer Price Guide this week are to the downside as sellers are currently outnumbering buyers in most selling venues. Dealers on the teletype systems are offering long lists of coins for sale at discounts of previous levels. Morgan Dollars are covered with declines centered mostly in the MS64 & MS65 grades. The 1887 S in MS65 fell to $1,425 Market and the 1889 O in MS65 is down to $3,150. Even the rare 1884 S in MS63 dropped to a lower Market price of $43,500. 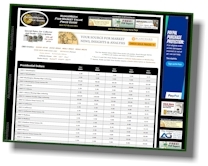 Generic Morgan Dollars are down to $56 in MS64 and $105 in MS65.